“Sneaky Silverware Exchange” from Christian Faith Publishing author Margaret Lenzmeier tells a wonderful tale that leaves lessons to ponder upon to people looking for a purpose in life. “Sneaky Silverware Exchange”: a charming fable that shows how one’s selfish desire will always have dire consequences. 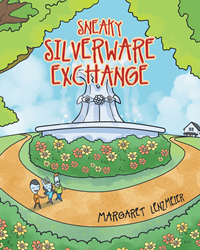 “Sneaky Silverware Exchange” is the creation of published author, Margaret Lenzmeier, a loving wife, mother, and grandmother. Published by Christian Faith Publishing, Margaret Lenzmeier’s new book reminds the valuable significance of submitting to God’s design for one’s life and never becoming stubborn to his laws. The book’s story was originally written during the 1980s. Finally, the author brings to life this wondrous tale that will illuminate the readers with God’s purposeful plan for life. View a synopsis of “Sneaky Silverware Exchange” on YouTube. Consumers can purchase “Sneaky Silverware Exchange” at traditional brick & mortar bookstores, or online at Amazon.com, Apple iTunes store, or Barnes and Noble. For additional information or inquiries about “Sneaky Silverware Exchange”, contact the Christian Faith Publishing media department at 866-554-0919.